How can I get Copies of my High School Records? Obtaining official high school records, such as transcripts or copies of a diploma, usually involve a small fee. High school records may come in handy for a variety of circumstances late in life. They may be necessary for college admissions, to prove diploma status, or even in some types of legal cases. It is usually a fairly simple process to get copies of high school records, but it is important to be clear about which files are needed and whether official or unofficial records will suffice. Some school districts provide unofficial records that can serve as an informative guide for former students. These may include grades, personal information, and graduation date. Informal transcripts may be available on a school website or through the main office of a high school. These are generally simple printed documents and are not usually considered sufficient for college or job applications. 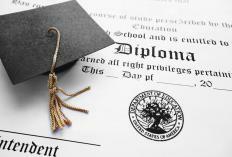 Official high school records, such as official transcripts or copies of a diploma, may take a little longer to get and usually involve a small fee. These may come in sealed envelopes that need to remain sealed in order to be considered valid. Many records offices will send these directly to the school, job, or other source that is requesting the information about a former student. This ensures that the student does not have the opportunity to tamper with the documents. To find these records, the best place to start is usually the school itself. Even if they do not maintain the records on campus, they will usually be the best source of information as to where to find official copies. Visit or phone the school's main office, and be sure to bring or know pertinent information, such as Social Security number, dates of attendance and graduation, and student identification numbers. If calling or emailing, the school may request a photocopy or fax of a driver's license or other official ID before releasing any documents. If the school has closed or does not maintain records on site, contact the school superintendent. This overseeing body may be required to keep records for legal purposes, and may be more able to handle requests for high school records from prior decades. If the superintendent's office is unable to help, contact the regional or state department of education. This process may take several weeks or even months to complete, so be sure to leave enough time to get records from the high school before applications are due. High school records can usually only be released to the individual named in the records, unless he or she is under 18. Written permission or a signed release form by the former student may be required before the records can be released to anyone else, even a spouse, sibling, or parent. To see who may or may not get access to school records without permission, check regional laws on student privacy and school recording practices. Are Vinyl Records Still Available? What Is a School Front Office? What Are the Different Types of Jobs for High School Graduates? What can I Expect After High School Graduation? Who is Allowed to Read my Child's Public School Records? High school football records and high school track and field records are also available upon request. Just as academic records help students get on the right track when choosing their college coursework, sports related records may be necessary to present for students who want to continue to play sports in college.